The Federal Highway Beautification Act of 1965 requires MoDOT to regulate outdoor advertising under 23 CFR Section 750. Missouri’s rules and regulations regarding the control of outdoor advertising are located in RSMo Sections 226.500 to 226.600 and 7 CSR 10-6. MoDOT is required to regulate the location, size, spacing and lighting of outdoor advertising signs. Municipalities may enact ordinances that are more restrictive than state outdoor advertising regulations. In order to maintain effective control of outdoor advertising, an inventory system is maintained in MoDOT's Transportation Management System (TMS). This allows staff to directly link to relevant MoDOT applications; easily update and manage sign traits; attach and view photos and correspondence; and generate template correspondence and reports. Failure to provide effective control of outdoor advertising could cause the State of Missouri to lose up to ten (10) percent of its annual share of Federal Highway Administration construction money as provided in 23 USC 131 (b) and Missouri's federal-state agreement between MoDOT and the Federal Highway Administration dated February 22, 1972. Procedures have been established to enable outdoor advertising staff to be informed and able to perform their duties in a skillful manner. Each employee is a professional and must accomplish assigned duties in a proficient manner. This procedure guide contains the regulations, requirements and procedural directives governing the operations of outdoor advertising control and will be updated and amended as needed. This article is to be used as the policy and procedure guide for MoDOT. The contents establish a uniform method for completing each phase of the outdoor advertising process. Authority to deviate from the prescribed policy should be obtained from the outdoor advertising manager. 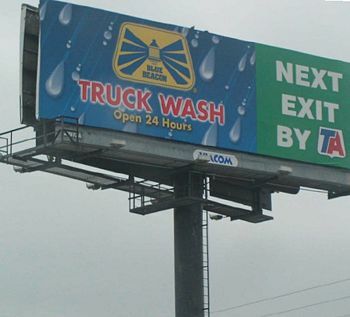 MoDOT has only one standard of operation, which is applicable for all outdoor advertising processes. Federal regulations governing outdoor advertising are located in 23 CFR Section 750. The Federal Highway Administration and MoDOT work cooperatively to ensure federal requirements are met to avoid loss of construction money. The role of MoDOT's outdoor advertising staff is to promote consistent business practices for the control of outdoor advertising. This effort is achieved through cooperation with the industry, public and other federal, state and city organizations, as well as MoDOT partnering divisions. The Outdoor Advertising Central Office is located in Jefferson City, Missouri, with six area specialists located throughout the state to best serve our customers. Activities outlined in the following portions of this article should be undertaken by each outdoor advertising employee. Applications, brochures and other information can be acquired through the central office, area offices or MoDOT’s outdoor advertising website. Completed applications can be mailed or hand delivered to the address listed above for the applicable county. MoDOT is responsible for regulating outdoor advertising adjacent to the Interstate System, National Highway System (NHS) and highways classified as Federal Aid Primary as of June 1, 1991 (FAP-1991). (Refer to the map, county map or description). On October 1, 2012, the federal transportation reauthorization act, Moving Ahead for Progress in the 21st Century (MAP 21) became effective, modifying the routes that are classified as part of the enhanced NHS. Off-premises signs located along these routes prior to October 1, 2012, were grandfathered and required to obtain an outdoor advertising permit from MoDOT (see EPG 236.16.10.1 Adding Controlled Routes). 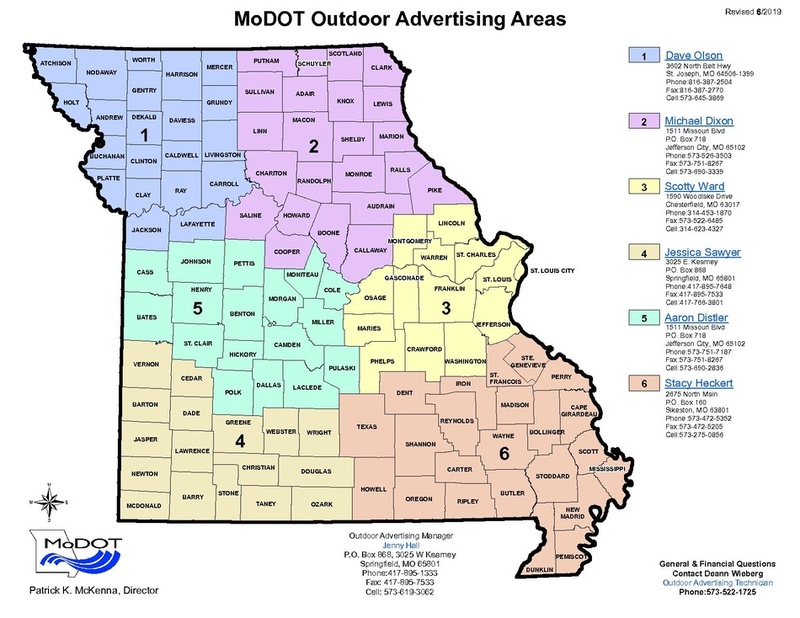 After October 1, 2012, off-premises advertising along these routes shall meet current permit requirements and obtain a permit from MoDOT prior to erection (see EPG 236.16.5 Permitting Outdoor Advertising). Routes classified as FAP-1991, will continue to be regulated for the control of outdoor advertising regardless of owner or functional classification changes. Based on changes made to functional classifications, routes classified as NHS that are not classified as FAP-1991, may be added or removed for the control of outdoor advertising. MoDOT Transportation Planning, with approval from the Federal Highway Administration, determines this information (see EPG 236.16.10 Adding or Removing Controlled Routes). MoDOT is responsible for regulating outdoor advertising adjacent to controlled routes. Off-premises signs located along these routes are required to obtain and maintain an outdoor advertising permit from MoDOT. On-premises signs are not required to meet the permit requirements or obtain a permit from MoDOT. Types of outdoor advertising include Billboard, Directional, Service Club & Religious Notices, Official, Public Service, and Public Utility. A billboard is outdoor advertising that displays products or services that are not available at the sign location. Billboard signs require a $200 application fee with $100 biennial renewal fees, except religious, service, veteran and fraternal organizations that meet the billboard criteria and are less than 76 square feet shall not require an application fee or biennial renewal fee. Standards for billboard signs are located in RSMo Section 226.540 and 7 CSR 10-6.040. 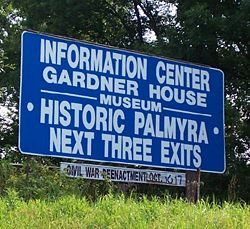 Directional signs are signs containing directional information that have been determined to be of interest to the traveling public. Applications for new directional signs are reviewed by the outdoor advertising manager for approval. Outdoor advertising that meets the directional criteria requires a $200 application fee with $100 biennial renewal fees, except religious, service, veteran and fraternal organizations that meet the directional criteria and are less than 76 square feet shall not require an application fee or biennial renewal fee. Standards for directional signs are located in RSMo Section 226.520 and 7 CSR 10-6.020. Service club and religious notices are signs and notices relating to religious, fraternal, service, and veteran organizations. These signs are issued to the organization and cannot bear an advertising message. Service club and religious notices shall be limited to 8 square feet, shall not require an application fee or biennial renewal fee, and shall not have to meet spacing or location requirements. Standards for service club and religious notices are located in 7 CSR 10-6.020. This procedure provides guidance for the permitting process of outdoor advertising in accordance with RSMo Sections 226.500 to 226.600 and 7 CSR 10-6. The application should be time and date stamped. If two or more applications are received at the same time or the time/date cannot be distinguished, the area specialist should contact the outdoor advertising manager for direction. In general, the time/date stamp or postmark dictates the order the applications are accepted for review. The information provided on the application, including involved party information, should be entered and assigned a transaction number with status “RECORDED” with reason “PENDING”; and appropriate permit type (see EPG 236.16.4 Types of Outdoor Advertising), status “RECORDED” with reason “PENDING INSPECTION”. The application fee shall be forwarded to the Financial Services Office for deposit (see EPG 236.16.24 Financial Transactions). Outdoor advertising permit applications will be reviewed in the order received within ten (10) working days. If clarification of an item is necessary, a phone call may be placed to obtain clarification. The conversation may be documented in the comment section. If written clarification is necessary, the applicant may be given an appropriate deadline of not more than ten (10) working days to respond. If the application is incomplete, it may be rejected (see EPG 236.16.5.5 Denying a New Permit). The area specialist should perform a site inspection and enter this information into TMS. Original applications that have been resubmitted should be entered under the original transaction number with permit status of “RESUBMITTED” and reason “RESEARCH”. In accordance with RSMo Section 226.541 and 7 CSR 10-6.040 (6), a moratorium of new outdoor advertising permits will be imposed within the outdoor advertising control area for that section of highway scheduled for construction or reconstruction where funding for right of way acquisition is approved by the Missouri Highways and Transportation Commission under the Statewide Transportation Improvement Program (STIP). Area specialists should be familiar with STIP projects in their respective area. Applications that meet the moratorium requirements shall be rejected (see EPG 236.16.5.5 Denying a New Permit). In accordance with USC Title 23, Section 131 (s) and 7 CSR 10-12.030 (12), no new outdoor advertising devices, with the exception of directional and service club and religious type signs, are allowed adjacent to highways designated as scenic byways. In accordance with RSMo Section 226.801, areas zoned commercial or industrial at the time of designation shall not be considered scenic byways. Billboard type applications in unzoned areas and zoned areas other than commercial or industrial adjacent to a scenic byway should be rejected (see EPG 236.16.5.5 Denying a New Permit). If the application and site inspection meet the requirements, a permit shall be issued. The permit status shall be changed to “ACCEPTED” with reason “COMPLIANT” and the New Permit and New Permit Cover generated and sent to the permit owner. The permit and the application, along with the supporting documentation, should be attached in TMS. If the application and / or site inspection does not meet the requirements, the application should be rejected. The permit status shall be changed to “REJECTED” with the appropriate reason and the Reject Application Cover generated explaining the reason(s) for the rejection. Additional information regarding the rejection may be documented in the comment section. The rejection letter, along with the application and supporting documentation should be attached in TMS. The original application and supporting documentation should be returned to the applicant with the rejection letter. A refund of the application fee shall be requested through the Financial Services Office (see EPG 236.16.24.1 Request for Refund). In accordance with 7 CSR 10-6.070 (5), if an application is rejected, the applicant shall have twenty (20) working days to request in writing an informal hearing for the purpose of appealing the rejection. This procedure provides guidance for the biennial sign inspection process and the renewal of permits pursuant to RSMo Section 226.550 and 7 CSR 106.070. Newly issued permits are renewed two (2) years after the initial anniversary date. Following the two (2) year anniversary date, newly issued permits are pro-rated and placed in their respective county. Permitted signs are inspected during the same month biennially by county (see County Billing Cycle Chart). Between the 1st and 6th of each month, area specialists run the report “Biennial Permits Due by Area by County” or “Biennial Permits Due by Area and Name” to determine which permits are due for inspection. Prior to the end of the month, the specialist runs the report “Transactions without Inspections” to ensure all permits have been inspected. (Note: permits that do not require a biennial fee and have not been inspected will not appear on this report). All controlled routes in the county(s) due should be traveled for unauthorized illegal sign activity during the biennial inspection sixty (60) day time window. Unauthorized illegal sign activity should be documented and entered in TMS (see EPG 236.16.16 Unauthorized Illegal Outdoor Advertising). The biennial inspection, including comments, changes and photos, should be entered within the sixty (60) day inspection window. Permits that have a passing biennial inspection will be included in the billing cycle. Invoices are created in the Financial Services Office and mailed directly to the permit owner (see EPG 236.16.24.3 Biennial Renewal Fees). The technician runs the monthly report “Cash Receipts” and generate the Biennial Permit Cover and Biennial Permit for permits with a biennial payment. The cover letter and permit should be sent to the permit owner. The technician runs the monthly report “Exempt Permits Due by Area by County” and generates the Biennial Permit Cover and Biennial Permit for permits that do not require a biennial fee. Newly issued permits that were not built within the two (2) year time-frame shall be voided (see EPG 236.16.20 Voiding of Outdoor Advertising Permits). Permitted outdoor advertising signs are classified as recorded, conforming, conforming out of standard, nonconforming, or illegal based on current statutory and administrative rule requirements for outdoor advertising. The sign status should be updated during the inspection process and as required. Permit owners should contact the area specialist prior to making any structural changes to a sign to ensure compliance. Upon receiving an Application for Permit to Erect or Maintain Outdoor Advertising, the status for the transaction is classified as recorded. Transactions that are accepted remain in recorded status until such time the sign is completely constructed within the two (2) year time-frame. If the sign is completely constructed within the time-frame, the sign status should be changed to conforming, conforming out of standard, nonconforming or illegal pursuant to RSMo Sections 226.500 to 226.600 and 7 CSR 10-6. A permitted sign is classified as conforming when it meets the current statutory and administrative rule requirements for outdoor advertising pursuant to RSMo Sections 226.500 to 226.600 and 7 CSR 10-6. A permitted sign is classified as conforming out of standard when it fails to meet the current statutory and administrative rule requirements for outdoor advertising, but currently complies with the terms of the Missouri's federal-state agreement and meets the August 27, 1999, statutory and administrative rule requirements that governed outdoor advertising and the Highway Beautification Act of 1965. Requirements for conforming out of standard signs are located in RSMo Section 226.541, 7 CSR 10-6.040 and 7 CSR 10-6.070. When a permit status is changed to conforming out of standard, the Sign Status Conforming Out of Standard should be generated and sent to the sign owner. A permitted sign is classified as nonconforming when it fails to comply with current outdoor advertising rules and regulations. Requirements for nonconforming signs are located in RSMo Section 226.540 and 7 CSR 10-6.060. When a permit status is changed to nonconforming, the Sign Status Nonconforming should be generated and sent to the sign owner. A permitted sign is classified as illegal when it has violated one or more current statutory and administrative rule requirements for outdoor advertising pursuant to RSMo Sections 226.500 to 226.600 and 7 CSR 10-6. This procedure provides guidance for the various inspection processes for outdoor advertising. The Field Inspection Form, Location Diagrams and Freeway/Primary Diagram may be referenced when performing inspections. The distance to the nearest off premise sign(s) including unbuilt permitted signs shall be measured. To qualify for a new permit, this measurement must be a minimum of one thousand four hundred (1,400) feet as measured along the nearest edge of the pavement of the controlled travelway(s) pursuant to RSMo Section 226.540 (3). The proposed sign location must be located within six hundred sixty (660) feet of the right of way, as measured perpendicular to the controlled travelway. The proposed location must also be within seven hundred fifty (750) feet of a qualifying business' regularly used business activity area. The qualifying business must be visible and recognizable as a commercial or industrial activity. Further business requirements are located in RSMo Section 226.540 (6) and 7 CSR 10-6.040. For convenience, use the Qualifying Business Checklist when completing the site inspection. Zoning shall be verified. The area may not be spot or strip zoned for the sole purpose of outdoor advertising. Further zoning requirements are located in RSMo Section 226.540 (6) and 7 CSR 10-6.040). Outside of incorporated municipalities, no sign shall be located within five hundred (500) feet of an interchange or rest area pursuant to RSMo Section 226.540 (3). The log mile may be determined and recorded using the distance measuring device installed in the state vehicle and the appropriate county log book available on TMS. When a permit is issued, the permit holder has two (2) years to construct the sign and affix a message. If the sign is not completed in that period, the permit shall be voided (see EPG 236.16.20 Voiding of Outdoor Advertising Permits). After the sign construction is complete, a complete inspection should be conducted and entered in TMS. All new permits have a biennial inspection two (2) years from the acceptance date and will then be prorated and placed in their respective county following their two (2) year anniversary date. After the initial two (2) year anniversary date, all permits in a particular county are renewed in the same month (see County Billing Cycle Chart). During the inspection, any changes to the sign should be noted. The sign status and all billboard traits, including the message and cutouts/extensions, should be verified. A surprise inspection may be conducted and entered in TMS when changes have been noted. Any changes to the sign may be noted in the comments section and shall include compliance information. The specialist will verify the cut area to ensure slope stability and safety concerns. The area specialist should inspect the site upon notification the vegetation cut is complete or within thirty (30) days of the permit expiration and ensure the work was done to the specifications as outlined in the permit and that there was no damage to right of way. Upon removal of a permitted sign, the area specialist should inspect the site prior to sending the Signature to Void Permit and voiding the permit. Upon receipt of a digital upgrade request, the area specialist should inspect the sign using the Field Inspection form prior to sending the Digital Upgrade Approval or Digital Upgrade Denial Letter. When a digital upgrade is approved, the permit owner has twelve (12) months to complete the upgrade. If the upgrade is not completed within that time period, the request expires. Digital brightness should be measured with the MoDOT-provided luminance meter and the digital rotation rate timed to ensure compliance and instantaneous rotation. This procedure provides guidance for the maintenance and repair of permitted outdoor advertising in accordance with RSMo Sections 226.500 to 226.600 and 7 CSR 10-6. Upon identification of a permitted sign in violation of the rules and regulations, the area specialist may generate a courtesy letter explaining the violation(s) and remedial action, if any, with an appropriate deadline of not more than thirty (30) days to complete the remedial action. The letter should be sent to the permit owner and attached in TMS and maintained in file storage. Upon expiration of the remedial action, if the sign remains in violation, a Notice to Remove Outdoor Advertising or Notice to Terminate Nonconforming Outdoor Advertising may be requested. The Billboard Diagram may be referenced when determining whether the sign is damaged beyond the legal limits. Permitted signs should not contain obsolete advertising or be maintained without an advertising message. Upon identification of a sign with obsolete advertising or without an advertising message, the Courtesy Obsolete Ad or No Ad should be generated and sent to the permit owner. A Notice to Remove Outdoor Advertising or Notice to Terminate Nonconforming Outdoor Advertising may be requested for signs that have been maintained without an advertising message or contain obsolete advertising for a continuous period of twelve (12) months or more. In accordance with RSMo Section 226.580, permitted signs that are not in good repair should be deemed unlawful and subject to removal. Upon identification of a sign not in good repair, the Repair Letter Conforming, Repair Letter Conforming Out of Standard, or Repair Letter Nonconforming should be generated and sent to the permit owner. A Notice to Remove Outdoor Advertising or Notice to Terminate Nonconforming Outdoor Advertising may be requested for signs that have not been repaired within the thirty (30) day time-frame. Upon identification of a conforming out of standard sign damaged more than fifty (50) percent, the Courtesy Conforming Out of Standard Damaged should be generated and sent to the sign owner. Once the sign has been removed in its entirety, the permit shall be voided (see EPG 236.16.20 Voiding of Outdoor Advertising Permits). If the sign structure is substantially rebuilt pursuant to RSMo Sections 226.541 and 7 CSR 10-6.040, a Notice to Remove Outdoor Advertising may be issued. Upon identification of a nonconforming sign deteriorated or damaged more than fifty (50) percent, the Courtesy Nonconforming Damaged should be generated and sent to the sign owner. Once the sign has been removed in its entirety, the permit shall be voided (see EPG 236.16.20 Voiding of Outdoor Advertising Permits). If the sign structure is not removed in its entirety within thirty (30) days or is repaired, a Notice to Terminate Nonconforming Outdoor Advertising may be issued. Based on changes made to functional classifications, routes classified as the National Highway System (NHS) that are not classified as Federal Aid Primary as of June 1, 1991, may be added and removed for the control of outdoor advertising. Routes reclassified and designated as NHS shall be regulated for the control of outdoor advertising. Existing off-premises advertising located along the route prior to NHS designation shall be grandfathered and required to either obtain a permit or remove the sign in its entirety. The route should be inventoried within ninety (90) days of notification to document off-premises advertising with a site inspection to determine sign status. Prior to sending any correspondence to sign owners, the area specialist should contact the respective city/county to explain the process; and check if they maintain an existing inventory of off-premises signs, pending permits for new off-premises signs, or pending permits for sign changes. Off-premises advertising that has not been approved as grandfathered should be considered illegal (see EPG 236.16.16 Unauthorized Illegal Outdoor Advertising). Off-premises advertising that has been approved as grandfathered should be assigned a transaction number with the appropriate status of outdoor advertising and reason. The permit type should remain as “PSEUDO” with status of “TEMPORARY” reason “AUTO SETUP” and either the MAP 21 Notification or MAP 21 Notification Exempt generated and sent to the sign owner, advertiser or landowner. Upon receipt of a completed Application for Permit to Erect or Maintain Outdoor Advertising and a complete inspection, a permit shall be issued (see EPG 236.16.5 Permitting Outdoor Advertising). If a response is not received after thirty (30) days, a field inspection should be completed to confirm the sign status. Further research may be necessary to confirm ownership. If the sign has not been removed in its entirety, a second courtesy letter should be generated and sent to the sign owner, advertiser, or landowner. If a response is not received and the sign has not been removed in its entirety after sixty (60) days of the original courtesy letter, a Notice to Remove Outdoor Advertising may be issued. Landowner information shall be obtained prior to issuing the notice and may be determined by researching county records in the assessor’s office. Routes that are not part of FAP-1991 and are reclassified and removed from the NHS shall no longer be regulated for the control of outdoor advertising. Upon approval by the Federal Highway Administration and the outdoor advertising manager, permitted signs along these routes shall be voided (see EPG 236.16.20 Voiding of Outdoor Advertising Permits). This procedure provides guidance for the tracking and documentation of cutouts and extensions to billboards pursuant to RSMo Section 226.540 (2) (a) and 7 CSR 10-6.060 (3) (C). If a cutout/extension was in place on conforming outdoor advertising prior to becoming nonconforming, the extension shall be considered grandfathered and may remain in place; however, if the display changes after it becomes nonconforming, it may then be subject to the requirements of 7 CSR 10-6.060 (3) (C). Upon identification of a grandfathered cutout/extension, the “EXTENSION” trait should be updated to “GRANDFATHER”. Once the grandfathered cutout/extension is removed, the “EXTENSION” trait should be updated to “NO”. To determine the percentage of a cutout/extension, the area of the smallest square, rectangle, triangle, circle, or contiguous combination of shapes that will encompass the cutout/extension will be calculated and divided by the permanent display area of the sign. The total display area, including the cutout/extension, for each side of the sign is less than or equal to eight hundred (800) square feet, the cutout/extension should be allowed indefinitely. The total display area, including the cutout/extension, for each side of the sign is greater than eight hundred (800) square feet and less than one thousand two hundred (1,200) square feet, the cutout/extension may be installed for the length of a specific display contract and limited to thirty-three (33) percent of the permanent display area. The cutout/extension area is thirty-three (33) percent or less of the total display area for each side of the sign prior to the cutout/extension addition. The period of time a cutout/extension is added to either side of a structure is for no more than three (3) years or the term of the display contract whichever is shortest. After a side has had a cutout/extension for that time period, a cutout/extension cannot be placed on that side for a period of six (6) months. Upon identification of a temporary cutout/extension, the “EXTENSION” trait should be updated to “YES” and the Cutout Extension Request generated in TMS and mailed to the permit owner. The area specialist should follow-up to ensure the information is received. Failure to provide this information may cause a Notice to Terminate Nonconforming Outdoor Advertising or Notice to Remove Outdoor Advertising to be issued. Upon receiving the requested information, the display contract date information should be reviewed. If the display contact date information is longer than three (3) years, the permit owner should be informed that the cutout/extension is only allowed for three (3) years. The appropriate “AD BEGIN”, “AD END” and “AD<=33%” traits for the front and/or back of the sign should be updated and the documentation should be attached in TMS. Between the 1st and 6th each month, area specialists run the TMS report “Extension Report by Copy Date” to determine temporary cutout/extension dates that that are scheduled to expire. Within thirty (30) days prior to the expiration date, the Cutout Extension Expire should be generated in TMS and sent to the permit owner. A surprise inspection should be performed to verify the temporary cutout/extension has been removed after fifteen days past the expiration date. If the temporary cutout/extension has been removed, the date information for the appropriate “AD BEGIN” and “AD END” traits should be cleared out and the appropriate “AD<=33%” trait updated to “<NONE>”. Failure to remove the cutout/extension may cause a Notice to Terminate Nonconforming Outdoor Advertising or Notice to Remove Outdoor Advertising to be issued. Pursuant to RSMo Section 226.541and 7 CSR 10-6.040 (4) (I), a conforming out of standard sign may be upgraded with digital technology. RSMo Section 226.541 establishes criteria for upgrading conforming out of standard signs with digital technology, which requires the digital technology display size to be tracked. Upon identification by the area specialist, the Digital Box Request should be generated and sent to the permit owner. The permit owner has fifteen (15) days to submit this information. The area specialist should follow-up to ensure the information is received within the prescribed time-frame. The documentation should be attached in TMS. If the digital technology display size is up to twenty (20) percent of the sign face, the technology trait should be updated to “DIGITAL BOX”. If the digital technology display is more than twenty (20) percent of the sign face, the sign should be considered digital and the technology trait updated to “DIGITAL”. Upon receiving a written upgrade request from the permit owner, the trait “COS DIGITAL REQUEST” should be updated to “YES” and the written upgrade request attached in TMS. The area specialist should perform a digital site inspection and enter this information into TMS. The request will be time and date stamped. If two or more requests are received at the same time or the time/date cannot be distinguished, the area specialist should contact the outdoor advertising manager for direction. In general, the time/date stamp or postmark dictates the order the requests are accepted for review. If the upgrade request is approved, the “COS DIGITAL END DATE” trait should be updated to reflect 12 (twelve) months from the approval date with the Digital Upgrade Approval generated. The approval letter should be sent to the permit owner. The request and approval letter shall be attached in TMS. Between the 1st and 6th of each month, area specialists run the report “Digital Upgrade Report” to ensure digital upgrades are completed within the twelve (12) month time-frame. The area specialist should perform a digital complete inspection upon expiration or when the upgrade is complete and enter this information in TMS. If the upgrade was completed within the twelve (12) month time-frame, the “COS DIGITAL REQUEST” trait should be updated to “NO”; the “COS DIGITAL END DATE” should be cleared out; and the technology trait updated to “DIGITAL”. If the upgrade has not been completed within the twelve (12) month time-frame, the “COS DIGITAL REQUEST” trait should be updated to “NO” and the “COS DIGITAL END DATE” should be cleared out. The Digital Upgrade Expire should be generated in TMS. The expiration letter should be sent to the permit owner and attached in TMS. If the upgrade request is denied, the trait “COS DIGITAL REQUEST” should be updated to “NO” and the Digital Upgrade Denial generated. The denial letter should be sent to the permit owner. The request should be attached in TMS. Area specialists should perform a digital biennial inspection on all permits with digital technology and a digital surprise inspection as requested to ensure digital regulations are in compliance pursuant to 7 CSR 10-6.040 (4). This procedure provides guidance for the transfer of outdoor advertising permits in accordance with 7 CSR 10-6.070 (6) (B). A permit owner may transfer ownership of a sign(s) for which a permit is required. A $10 transfer fee is required for each permit (see EPG 236.16.24 Financial Transactions). The Application for Transfer of Outdoor Advertising Permit should be completed by the new permit owner and sent to the area office along with the transfer fee and bill of sale or proof of ownership, which must indicate the permit number. Permits will not be transferred if there are outstanding fees, which include sign removal costs, vegetation removal costs, or biennial permit fees. Upon receipt of the transfer application, the document should be time and date stamped. The application and supporting documentation reviewed for accuracy. TMS should be checked to determine whether the new owner is listed as an involved party. If not, the owner information should be entered as a new involved party and forwarded to the outdoor advertising technician to create an account number. If the application meets all of the requirements, a transfer permit shall be issued. The transfer should be completed under “Permit Transfer” with the Transfer Permit Cover and Transfer Permit generated. The cover letter and permit should be sent to the new permit owner. The permit, along with the application and supporting documentation, should be attached in TMS. If the application does not meet the requirements, it should be rejected. The Reject Transfer Cover generated explaining the reason(s) for the rejection. Additional information regarding the rejection should be documented in the comments section. The application, rejection letter and supporting documentation attached in TMS. The original application and supporting documentation should be returned to the applicant with the rejection letter. A refund of the application fee should be requested through the Financial Services Office (see EPG 236.16.24.1 Request for Refund). This procedure provides guidance for the cutting and trimming of vegetation under controlled conditions on highway right of way pursuant to RSMo Sections 226.130 and 226.585, and 7 CSR 10-6.085. A vegetation permit should not be issued for sections of highway involved in active construction or reconstruction under the Statewide Transportation Improvement Program. Upon receipt of an Application for Outdoor Advertising Vegetation Permit, the document should be time and date stamped and entered under “Permit / Agreement List” with status “RECORDED” and reason “RESEARCH”. Minimum $1,000 performance bond on file with MoDOT Traffic & Highway Safety Central Office. If the applicant does not have a performance bond on file, they may submit a check in the amount of $1,000 per application as the performance bond (see EPG 236.16.24 Financial Transactions). Site drawing of the location of the proposed cutting or trimming. Applicant agrees to hold harmless the Commission, its officers and employees from all liability, judgments, costs, expenses and claims growing out of damages of any nature whatsoever, to any person or property arising out of performance or non-performance of said work, or existence of said improvements. The applicant should carry commercial general liability insurance and commercial automobile liability insurance from a company authorized to issue insurance in Missouri and to name the Commission and MoDOT and its employees, as additional named insured in amount sufficient to cover the sovereign immunity limits for Missouri public entities as calculated by the Missouri Department of Insurance, Financial Institutions and Professional Registration and published annually in the Missouri Register pursuant to RSMo Section 537.610. Applicant shall inspect the property before vegetation control and evaluate all potential risks, both seen and unseen. Applicant waives all rights to claims against the Commission and MoDOT and its employees or officers arising due to injuries resulting from the actions of applicant, its agents, officers, employees or assigns under the permit. If necessary, the district roadside manager and the applicant’s vegetation contractor should be contacted to review the location and determine if some or all vegetation should remain for slope stability or safety concerns. The area specialist should perform a vegetation site inspection and enter this information into TMS. The specialist or roadside manager will verify the cut area to ensure slope stability and safety concerns. Only herbicides approved by MoDOT’s authorized representative may be used to trim or remove vegetation (refer to EPG 821.25 Products). Only general use non-restricted herbicides may be used. All herbicides must be used in strict accord with the manufacturer’s instructions on the label. Restricted use herbicides may not be used on the right of way. The applicator must be a certified commercial applicator or under the supervision of a certified commercial applicator and all desirable vegetation must be avoided. All trees controlled with herbicides should be cut down and removed within sixty (60) days of treatment. Trimming, cutting or removal of trees three inches or greater in diameter, as measured at a point 54 inches above ground, that are considered suitable roosts for Indiana Bats and Northern Long-Eared Bats is prohibited from April 1 through October 31 due to these species being protected under the Endangered Species Act. Applicants may contact the specialist or submit a habitat assessment of the proposed cut area from a qualified consultant for consideration from April 1 through October 31. Trees of any size may be trimmed in accordance with the following guidelines under a vegetation permit. A tree may not have more than one third of its canopy removed in a single pruning operation. Refer to the Tree Pruning Chart. The National Arborist Association Standards should be used as a guideline to insure trees are being pruned properly and all pruning must be done in accordance with these standards. Pruning cuts should be made so that the tree may close the resulting wound as easily as possible. Remove parts of a twig or branch at their origin. Remove tips of branches back to a good bud or to the next larger branch. The final pruning cut should be made along the natural branch collar and not flush with the trunk. Any additional pruning of this magnitude cannot be repeated for three (3) full years on hardwood species. In situations where pruning is to be done on a stand of trees and it is not practical to distinguish individual trees, the stand should be judged by the canopy height of the stand. The amount of tree height to be removed should be determined from the Tree Pruning Chart according to the canopy height of the stand of trees. Brush over six (6) feet that is approved for removal should be cut first and the stump(s) treated with herbicides. Applicants are encouraged to avoid mowing and brush hogging from August 15 through October 31 to encourage the proliferation of the pollinator species by allowing the seeds of existing favorable plant species to mature and be viable for the next growing season. If the vegetation application and inspection meet all the requirements as outlined in RSMo Section 226.585, 7 CSR 10-6.085 and EPG 236.16.15 Vegetation Removal, a vegetation permit should be issued. A vegetation site inspection should be entered and the vegetation permit status shall be changed to “ACCEPTED” with reason “COMPLIANT” with the Vegetation Permit and Vegetation Permit Cover generated. The cover letter and permit should be sent to the permit owner. Additionally, the permit should be sent to the appropriate roadside manager. The application and supporting documentation should be maintained until the vegetation permit is released or voided. If the vegetation application or inspection does not meet the requirements, the application should be rejected. A vegetation site inspection should be entered and the vegetation permit status changed to “REJECTED” and the reason changed accordingly with the Reject Vegetation Cover generated explaining the reason(s) for the rejection. Additional information regarding the rejection should be documented in the comments section. The application, rejection letter and supporting documentation should be attached in TMS. The original application and supporting documentation should be returned to the applicant with the rejection letter. A refund of the cash performance bond (if applicable) shall be requested (see EPG 236.16.24.1 Request for Refund). In accordance with 7 CSR 10-6.085 (4), if an application is rejected, the applicant has twenty (20) working days to request in writing an informal hearing for the purpose of appealing the rejection (see EPG 236.16.18.1 Informal Hearing). The applicant has three hundred and sixty five (365) days to perform the vegetation removal. Between the 1st and 6th of each month, area specialists run the report “Active Vegetation Permits by Area” or “Active Vegetation Permits by Area by Route” to determine which permits are due for inspection. The area specialist should perform a vegetation follow-up inspection when they have been notified the vegetation cut is complete or within thirty (30) days of the permit expiration, whichever comes first. If the follow-up inspection passed and entered within the thirty (30) day time-frame, the vegetation permit status should be changed to “RELEASED” and reason “COMPLETE”, and a refund of the cash performance bond (if applicable) shall be requested (see EPG 236.16.24.1 Request for Refund). If the follow-up inspection passed and is not entered within the thirty (30) day time-frame, the vegetation permit status should be changed to “VOID” with the appropriate reason and a refund of the cash performance bond (if applicable) shall be requested (see EPG 236.16.24.1 Request for Refund). The applicant will be held responsible for any damage to the right of way. If illegal cutting and/or damage to right of way occurs, the area specialist should immediately assess the damages with the district roadside manager, photograph the location and document the damages in TMS. The area specialist should work with the outdoor advertising manager to prepare a letter to the permit owner advising them of the damage and any remedial action or penalties. The applicant’s performance bond may be applied towards the damage. For remedial action, if the permit has expired or a permit was not issued, the applicant should submit an application to perform the clean-up work (see EPG 236.16.15.9 Issuing a Vegetation Permit). The area specialist should perform a vegetation follow-up inspection to ensure any remedial action is completed. Photos should be taken and attached in TMS. If the remedial action is satisfactory, the vegetation permit shall be released (see EPG 236.16.15.11 Releasing a Vegetation Permit). For monetary penalties, the information should be forwarded to the outdoor advertising technician to create an invoice. This amount should also be recorded in TMS for the vegetation permit under “Fee”. Upon payment, the invoice number should be referenced on the transmittal (see EPG 236.16.24 Financial Transactions) and the vegetation permit shall be released (see EPG 236.16.15.11 Releasing a Vegetation Permit). This procedure provides guidance for the expeditious removal of unauthorized illegal signs in accordance with RSMo Section 226.580 and 7 CSR 10-6.080. All controlled routes should be traveled for unauthorized sign activity during the biennial inspection and on a regular basis. Unauthorized illegal sign activity should be documented with photos and assigned a transaction number with a status of “ILLEGAL” and the appropriate reason. The permit type should remain as “PSEUDO” with status “TEMPORARY” and reason “AUTO SETUP”. The reason for the illegality should be noted in the comments section. The area specialist may generate the Illegal Profile Sheet for their records. Depending on the type of outdoor advertising and if the sign could meet the permit requirements, the appropriate courtesy letter generated and sent to the sign owner, advertiser or landowner. If a response is not received after thirty (30) days, a field inspection should be completed to confirm sign status. Further research may be necessary to confirm ownership. If the sign is has not been removed in its entirety, a second courtesy letter should be generated and sent to the sign owner, advertiser, or landowner. If a response is not received and the sign has not been removed in its entirety after sixty (60) days of the original courtesy letter, a Notice to Remove Outdoor Advertising may be issued. Landowner information should be obtained prior to issuing the notice and may be determined by researching county records in the assessor’s office. This procedure provides guidance for the expeditious removal of illegal outdoor advertising. Illegal conforming and conforming out of standard outdoor advertising should be issued a Notice to Remove Outdoor Advertising in violation of RSMo Section 226.580 and 226.541. Illegal nonconforming outdoor advertising should be issued a Notice to Terminate Nonconforming Outdoor Advertising in violation of RSMo Section 226.580 and 7 CSR 10-6.060. A Request to Issue Notice should be generated and sent to the outdoor advertising manager for review. Upon approval, the status should be changed to “ILLEGAL” with the appropriate reason and the Notice to Remove Outdoor Advertising, Notice to Remove Cover-Owner, and Notice to Remove Cover - Land Owner generated for conforming and conforming out of standard outdoor advertising. The Notice to Terminate Nonconforming Outdoor Advertising, Notice to Terminate Cover-Owner, and Notice to Terminate Cover - Landowner should be generated for nonconforming outdoor advertising. The notice should include the reason(s) for the illegality and remedial action(s), if any, and sent certified mail to the sign owner and landowner. If delivery of the certified mail to the sign owner or landowner is unsuccessful, the notice should be delivered by hand or personal service. The date the certified mail was received, along with the certified mail number, or the date of delivery by hand or personal service should be entered under correspondence history. Certified mail receipts and green cards should be attached in TMS and forwarded to the outdoor advertising technician. Upon receipt of a notice, the sign owner or landowner has sixty (60) days to perform the remedial action(s), if any, indicated in the notice, or request an Administrative Review Hearing. If the sign owner or landowner has complied with the remedial action(s), if any, offered in the notice, the notice should be rescinded. Information regarding the reason the remedial action was required and the date it was completed should be documented in the comments section. The sign status should be changed from “ILLEGAL” back to the previous status with the appropriate reason. If the sign owner or landowner has not complied with the remedial action(s), if any, MoDOT may proceed with the removal process. 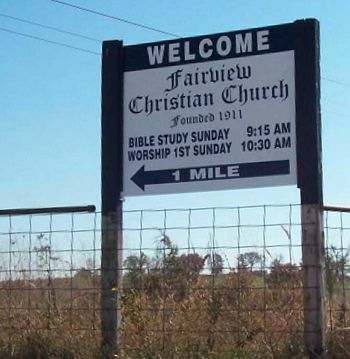 The Notice to Sign Owner and Notice to Landowner generated and sent to both the permit owner and landowner informs them that MoDOT will be contracting the removal of the sign. All costs associated with the sign removal should be billed to the permit owner. Upon removal of the sign, the permit status shall be changed to “VOID” with reason “REMOVAL” (see EPG 236.16.20 Voiding of Outdoor Advertising Permits). This procedure provides guidance for the various inspection processes for outdoor advertising. If the applicant requests an informal hearing within the required time-frame, a hearing should be scheduled. The permit status should be updated to “ADMIN REV” and reason “INFORMAL”. The Outdoor Advertising Central Office will schedule all informal hearings and should notify the applicant, Outdoor Advertising Review Committee, Chief Counsel’s Office, outdoor advertising manager, and area specialist of the time and date of the hearing. A letter containing this information should be sent to the applicant. The letter should be attached in TMS. The area specialist should inform the appropriate district engineer and area engineer of the hearing request. The review committee consists of the following MoDOT staff, as available on the date of the scheduled hearing: Assistant Chief Engineer, State Design Engineer and the Asst. to the State Design Engineer - Right of Way. An attorney from the Chief Counsel’s Office also attends the hearing to advise the committee on legal issues. The outdoor advertising manager or area specialist may also attend the hearing. A file including the application and rejection letter, along with other supporting data such as videos, photographs, drawings and maps should be provided to the committee members. The Assistant Chief Engineer should chair the meeting. The applicant is allowed the opportunity to present his / her case. The area specialist answers questions as directed by the chair. The committee reviews the information presented at the hearing and render a decision within five (5) business days. The outdoor advertising manager, with assistance from the Chief Counsel’s Office, prepares a letter of decision for the committee chair’s signature, which is sent to the applicant. If the review committee upholds the denial, all reasons for denial must be listed in the letter and the permit status updated to “REJECTED” with the appropriate reason. If the review committee overturns the permit application denial, the applicant should resubmit the original application (see EPG 236.16.5 Permitting Outdoor Advertising). The letter of decision should be attached in TMS. The outdoor advertising manager will forward the request information to the Chief Counsel’s Office upon review. If the request for hearing is within the sixty (60) day time-frame, the Chief Counsel’s Office should schedule the hearing and send written notification regarding the time, date and place of the hearing to the applicant, outdoor advertising manager, area engineer, district engineer and area specialist. The outdoor advertising manager should review the information and schedule a meeting with the area specialist and Chief Counsel’s Office. A follow up inspection and new photos may be required. At the hearing, the area specialist should be sworn in and testify to the reason(s) for issuing the notice. After the hearing, the Hearing Examiner will render a decision as to whether the notice was lawfully issued. This decision will be read before the Missouri Highways and Transportation Commission for a final decision. This decision should be submitted in writing to the outdoor advertising manager, area engineer, district engineer and area specialist. If the decision is not in favor of the applicant, the applicant has thirty (30) days after the decision is rendered to appeal to the Circuit Court. After the thirty (30) days has passed and if the permit owner has not removed the sign or filed an appeal, a memo from the Chief Counsel’s Office is generated allowing MoDOT to proceed with the removal process. The Notice to Sign Owner and Notice to Landowner should be generated and sent to both the permit owner and landowner informing them that MoDOT will be contracting the removal of the sign. All costs associated with the sign removal should be billed to the permit owner. Upon removal of the sign, the permit status should be changed to “VOID” with reason “REMOVAL” (see EPG 236.16.20 Voiding of Outdoor Advertising Permits). If the request for hearing is outside the sixty (60) day time-frame, the request should be denied by the Chief Counsel’s Office. Written notification regarding the denial should be sent to the applicant, outdoor advertising manager and area specialist. The applicant has thirty (30) days after the request was denied to remove the sign structure in its entirety. If the permit owner has not removed the sign structure within the thirty (30) day time-frame, MoDOT may proceed with the removal of the sign structure. The Notice to Sign Owner and Notice to Landowner should be generated and sent to both the permit owner and landowner informing them that MoDOT will be contracting the removal of the sign. All costs associated with the sign removal should be billed to the permit owner. If either party requests a withdrawal of the administrative review hearing, the area specialist should generate the Notice of Withdrawal (OAN-15) and forward the notice to the outdoor advertising manager. Upon review, the outdoor advertising manager should forward the information to the Chief Counsel’s Office. This procedure provides guidance for the control and removal of outdoor advertising signs purchased by the Missouri Highways and Transportation Commission (MHTC). The MHTC is directed to acquire by purchase, exchange, agreement, eminent domain, gift or condemnation and should pay just compensation for the removal of lawfully existing outdoor advertising signs. District right of way should notify the area specialist of off-premises advertising located within the scope of a project and schedule a field inspection with design, right of way, construction personnel and other team members as required. District right of way should provide the area specialist with the project number, parcel number, route, county and location of affected off-premises advertising. Upon review, the area specialist completes the ODA Profile Report for all off-premises advertising regardless of route. For permitted signs, the ODA Profile Report is generated in TMS and forwarded to the district Right of Way Manager. The report should be attached in TMS. When the sign is acquired, district right of way completes the report and forwards a copy to the area specialist. The completed report contains details of when the sign was purchased; extended possession agreements made between right of way and the permit owner and their terms; and removal information. The permit owner and landowner information should be updated in TMS to MoDOT, PO Box 270, Jefferson City, MO 65102. The completed profile report should be attached in TMS. Once the sign is removed in its entirety, the area specialist should perform a removal follow-up inspection and void the permit (see EPG 236.16.20 Voiding of Outdoor Advertising Permits). Qualifying signs displaced pursuant to RSMo 226.541 and 7 CSR 10-6.040 (7) should be reviewed by right of way and outdoor advertising for the sign agreement reset program. If a qualifying sign meets the reset requirements as determined by the ODA Profile Report, right of way may offer the permit owner the option to reset the sign elsewhere within the same property or on property adjoining the property it is currently located within. Right of Way completes the Partial Waiver and Reset Agreement with assistance from the area specialist. Right of Way forwards a copy of the executed agreement to the area specialist. Upon receiving the executed agreement, the area specialist updates the information in TMS and generate the Amended Permit and Amended Permit Cover. The executed agreement, permit and supporting documentation, should be attached in TMS. The area specialist should ensure the following requirements contained in the agreement are satisfied. The qualifying sign is removed from the construction limits as prescribed in the agreement. Information regarding whether or not the sign has been removed within the prescribed time-frame should be documented in TMS with photos and comments; and forwarded to the district Right of Way Manager. The new sign is completely erected as prescribed in the agreement within six (6) months of the final inspection of the project. If the sign is not erected as prescribed in the agreement, the permit should be voided (see EPG 236.16.20 Voiding of Outdoor Advertising Permits). For signs that are not permitted, the ODA Profile Report should be generated from SharePoint and forwarded to the district Right of Way Manager. The report should be maintained in file storage at the area office under ODA Profile Reports- Non Regulated Routes. This procedure provides guidance for voiding outdoor advertising permits in accordance with RSMo Section 226.580, 7 CSR 10-6.070 and 7 CSR 10-6.080. When a sign (including its support structure) has been removed, the following procedures should be followed prior to voiding of the permit. The removal follow-up inspection should be entered and the Signature to Void Permit should be generated containing a photo of the sign before it was removed. Two copies of the signature letter should be sent to the permit owner, along with a self-addressed stamped envelope. One copy is for their records and the other is to be signed and returned for the file. After receiving the signed signature letter, the permit should be voided. The permit status should be changed to “VOID” with the appropriate reason and the Notice of Void Cover and Notice of Void Permit generated. The cover letter and notice should be sent to the permit owner. The signed signature letter and notice should be attached in TMS. The area specialist should verify outstanding fees associated with the permit under “Receivables List”. If there are outstanding fees associated with the permit, the area specialist should forward a request for credit memo to the technician. The sign was not built within the two (2) year time-frame and the permit expired. -	Photos of the proposed location confirming the sign was not built should be taken and attached in TMS. The permit status should be changed to “VOID” with the reason “TIME LIMIT” and the Notice of Void Cover and Notice of Void Permit generated. The cover letter and notice should be sent to the permit owner. The notice should be attached in TMS. A Notice to Remove Outdoor Advertising or Notice to Terminate Nonconforming Outdoor Advertising has been issued and time limit has expired. -	The permit status should be changed to “VOID” with the appropriate reason and the Notice of Void Cover and Notice of Void Permit generated. The cover letter and notice should be sent to the permit owner. The notice should be attached in TMS. The sign was acquired for a project through district right of way. -	The permit status should be changed to “VOID” with the reason “ACQUISITION” and the Notice of Void Permit generated. The notice should be attached in TMS. The outdoor advertising is no longer adjacent to a controlled route as approved by the Federal Highway Administration (FHWA) and reviewed by the outdoor advertising manager (see EPG 236.16.10.2 Removing Controlled Routes). The permit status should be changed to “VOID” with the reason “RT NO LONGER CONTROLLED” and the Route No Longer Controlled and Notice of Void Permit generated. The letter and notice should be sent to the permit owner. The FHWA documentation and notice should be attached in TMS. Information regarding the route designation should also be documented in the comments section. The sign has been changed to an on-premises sign and will no longer contain off-premises advertising. Upon receiving a signed statement from both the permit owner and landowner indicating the sign will no longer contain off-premises advertising, the permit status should be changed to “VOID” with the reason “VOID-BB TO ON PREMISE” and the Notice of Void Cover and Notice of Void Permit generated. The cover letter and notice should be sent to the permit owner. The signed statement and notice should be attached in TMS and maintained in file storage. This procedure provides guidance for the removal process in accordance with 7 CSR 10-6.080 upon issuance of notice (see EPG 236.16.17 Issuing Notice to Remove or Notice to Terminate Outdoor Advertising). The sign removal should be accomplished through contract. The area specialist should contact General Services Procurement Central Office for further instructions. The district engineer, area engineer, maintenance superintendent and maintenance supervisor should be notified of the scheduled removal. The area specialist should be present at the time of the removal. Photos should be taken to adequately document each stage of the removal. Upon removal, the permit should be voided (see EPG 236.16.20 Voiding of Outdoor Advertising Permits). The technician should manually generate an invoice issued to the permit owner for all charges incurred for the sign removal. The invoice should be created in the financial transaction list in TMS with transaction type as “REMOVAL”. Monthly reports should be run to ensure outdoor advertising policies are completed as prescribed. All permitted outdoor advertising should be measured and located by Global Positioning System (GPS) coordinates within sixty (60) days of the complete inspection. Keeping safety as a priority, area specialists should work in teams to collect this data. Each team is assigned a set of GPS equipment. The area specialist should run the report “Sign Inventory for Signs without GPS” or “Sign Inventory for Signs without GPS by County” to determine permits that have not been measured and located by GPS. Fees may be received within each area office or in the Central Office; or by calling 573-526-4280 between 7:30 a.m. and 5:00 p.m. Monday thru Friday (see Payment Options). A Transmittal of Money shall be completed and forwarded to the Financial Services. Fees shall be deposited the same day as received. A copy of the transmittal shall be kept in the area office for one year. A request for refund should be forwarded to the outdoor advertising technician with the following information. Upon review, the technician should forward the refund request to the Financial Services Office for processing. A request for credit memo should be forwarded to the technician with the following information. Upon review, the technician should forward the request for credit memo to the Financial Services Office for processing. This procedure provides guidance regarding the biennial renewal fee and delinquent fee process in accordance with RSMo Section 226.550 and 7 CSR 10-6.070. Invoices are created in the Financial Services Office and mailed directly to the permit owner. Permit owners have thirty (30) days from the invoice date to pay the invoice. If payment is not received within the thirty (30) day time-frame, a total of four (4) invoices will be generated over a four (4) month period or until the payment is received as outlined below. If payment is not received within thirty (30) days of the due date, a second invoice is generated. If payment is not received within sixty (60) days of the original due date, a third invoice is generated. If payment is not received within ninety (90) days of the original due date, an invoice indicating Final Notice is generated. If payment is not received within one hundred eighty (180) days of the original due date, an invoice referring to legal action is generated. If payment has not been received and the renewal fee is twelve (12) months delinquent a Notice to Remove Outdoor Advertising or Notice to Terminate Nonconforming Outdoor Advertising may be issued. Between the 1st and 6th of each month, the area specialist and technician should run the report “Delinquent Receivables” or “Receivables Past Due” to determine which permits are delinquent. The area specialist and technician should contact the permit owner regarding payment after the invoice reaches thirty (30) days past due until payment is received. Digital photos should be taken and attached in TMS using the naming convention below. Vegetation photos are uploaded under the original permit number, not the vegetation permit number. Photos can be uploaded individually in TMS under “Media”, “Add Document” or through the mass media upload process using the naming convention below. All files, correspondence and photographs should be retained for five (5) years following voiding of the permit or transaction. Copies of transmittal of money should be retained for one year. It is the policy of MoDOT to comply with the provisions of Chapter 610 of the 2000 Revised Statutes of Missouri (RSMo), as amended, the Missouri Open Records (Sunshine) law. Outdoor Advertising, a section of MoDOT, implements this Open Records Policy and Procedure to respond to requests for access to outdoor advertising records. Requests for information other than the outdoor advertising document list, brochures and rules or regulations must be submitted on the Records Request Questionnaire. MoDOT has appointed the Secretary to the Commission as the custodian of such records as required by Section 610.023, RSMo, as amended. Requests should be forwarded to the Secretary of the Commission, PO Box 270, Jefferson City, Missouri 65102, or by fax (573) 526-5419.